Our winery was founded in 1957 by Yves Brunot whose main activity since 1940 was agriculture and stock farming. At the beginning he was winegrower and farmer on the same time as the Champagne making business was an unsure resource of income at this time. 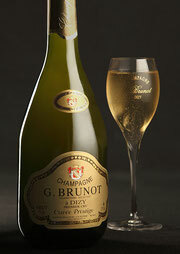 In the 1960s Yves Brunot began making his own Champagne. After his early death in 1970, his wife Lucienne and his son Guy continued his work. At this time there was no more agriculture activity but everything was focused on Champagne making. In 1979 Guy Brunot took over the lead of the winery together with his wife Bernadette. During nearly 30 years Guy and Bernadette developed the company by buying new wineyards, by increasing the capacity in tanks and cellars and by modernizing viticultural methods. In 1997 they founded the company Guy Brunot EARL (EARL = agricultural company with limited liability). In 2004, after the death of Guy Brunot, his wife Bernadette takes over the lead of the company assisted by her daughter Nathalie. In 2010 Bernadette retires and confides in Nathalie the lead of the company who is assisted by his German partner Achim. Over the years the company managed to retain traditional production methods such as the riddling of the bottles and the disgorging “à la volée” (taking out the yeast of the bottles by hand without freezing the neck of the bottle). Nathalie and Achim continue the development of the company by increasing sales in France, Europe and overseas and by producing grapes in an environmental friendly way in order to respect land and nature.